As winter dawns upon us (for those of us in the southern hemisphere), it seems harder and harder to get out of the house. The heater’s on, the kettle’s boiling, you’re in your snuggly booties and shapeless but warm trackie dacks, and the sofa looks more inviting than ever. But there are rewards for those who brave the chilling winds and venture into the depths of the country. The Yarra Valley isn’t exactly so far into the country anyway. In about an hour’s drive from the city, you can have yourself an excellent sample of local produce. Of course, you can go and pick your own apples, pears and what not, but how about having the fruits of the regional harvest expertly prepared and presented in a quaint setting (à la wicker chair, Victorian garden patio and starched napkins)? Then off you go to Healesville Hotel. They make it no secret that they were awarded ‘Country Restaurant of the Year’ by the 2006 The Age Good Food Guide; you’ll see signage all around the entrance of the restaurant displaying proudly the pair of hats (out of a maximum of three) they’ve earned. To be frank, we were indeed lured to this place because of its title, but became slightly wary about seeing the aggressive marketing leveraged from it when we arrived, but we’d made reservations and we’d driven this far, so there was no backing out. Lucky we didn’t because if only for the slippery jack gnocchi, it would have been worth the trip. We’d seen the slippery jacks for sale in the deli next door and weren’t particularly amused by the look of this large mushroom. Heaped into a basket, they looked flaccid and limp and had a colour that I could only describe as mouldy soil, but to our dismay these unwelcoming looking fungi were on the specials board for lunch, featuring in a dish of housemade gnocchi. 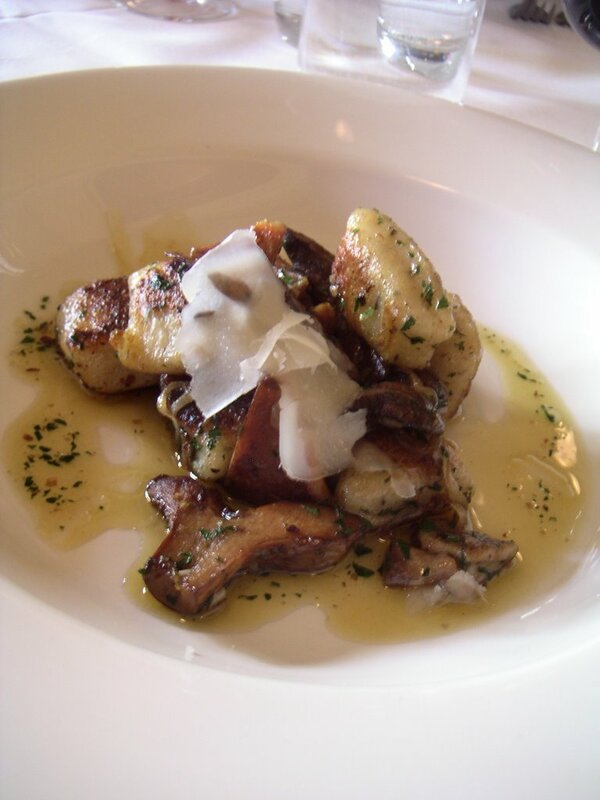 As it turns out, slippery jacks are firm, almost to the extent of having a crunch, and have a wonderful grassy, smoky flavour that proved themselves as the perfect partner to the fluffy pillows of potato gnocchi. Burnt butter with herbs brings the best of both worlds together. The menu tells us that the paprika grilled quail is from the Yarra Valley, and comes with roasted quince (very much in season), rocket and manchego cheese. It arrives butterflied, with a crisp, apricot brown skin, atop fresh green leaves and ruby red chunks of quince as promised. The quail is tender and juicy, however a little lacking in flavour. The main of roasted duckling is charming, although not as architecturally appealing as the previous dishes, but the depth of flavours make up for whatever was lacking. Wonderfully savoury, especially with the surrounding pool of reduction, the duckling was well complemented by the sweetness of the cannelloni packed with brightly coloured grated carrot. There are just enough choices for dessert to have any sweet tooth psychologically torn. 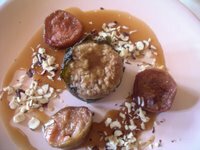 Although my hazelnut pudding with figs would have satisfied anyone, dessert fan or otherwise, as it was never cloyingly sweet; the pudding even had savoury qualities, and the vine leaf in which it was wrapped provided an additional shade of flavour that made the dessert feel wholesome yet sophisticated. A sprinkling of roughly chopped hazelnuts adds texture and brings a slightly ‘wild’ side to an otherwise tame dish. The winelist is incredibly long, and while the mixture of local, smaller labels as well as European selections is appreciated, brevity is what challenges the sommelier. Despite its slightly above-average (only very slightly) prices, given its relative proximity to metro Melbourne, the restaurant is quite popular, so remember to book ahead. Come on, produce this well used is worth getting out of your ugg boots for.